Over the past ten years, the places I’ve worked and students I’ve worked with have taught me the value of building connections and reconnecting to the land. It’s been a journey that has taken me in many directions, most recently to Victoria, B.C. In 2003, I had recently graduated university with a degree in Environmental Studies. 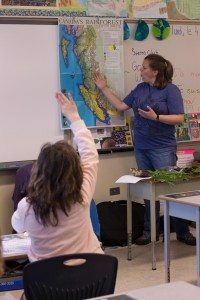 I wasn’t sure what I would do next and began working as a park interpreter and educator for my local conservation authority in southern Ontario. Crawford Lake Conservation Area offers a variety of activities and learning opportunities about its archaeological site, reconstructed longhouse village, and rare meromictic lake. 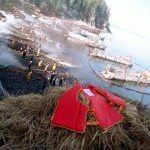 One of the most popular programs I taught was called Life in the Longhouse. This was an opportunity for students and visitors at the park to learn about life in a 15th century traditional Iroquoian longhouse village. I would take students and visitors on a tour of the longhouse and teach them everything from traditional fire starting skills to how deer could be harvested to make clothes and tools. My experience at Crawford Lake sparked my love for and interest in environmental education. Two years later, I began a certificate in ecological education from the University of Saskatchewan. During the summer my cohort and I traveled across the provinces of Saskatchewan and Alberta and learned hands-on skills for teaching experiential education. I spent my summer backpacking, canoeing, harvesting wild edibles, horseback riding, mountain climbing and camping under the wide open prairie sky. In the winter we lived in a cabin in Northern Saskatchewan. We worked on our survival skills and went snowshoeing, cross-country skiing and dog sledding. These experiences changed me. When I returned to city life, I realized that, for many people, our connection to the natural world has been disrupted. We spend our days wrapped up with writing e-mails or watching television, rather than collecting food or canoeing across a lake. It is valuable to stop and pause and reconnect with our sense of place. The students I have worked with over the last ten years have taught me to do just that. In 2013, I started my journey north. 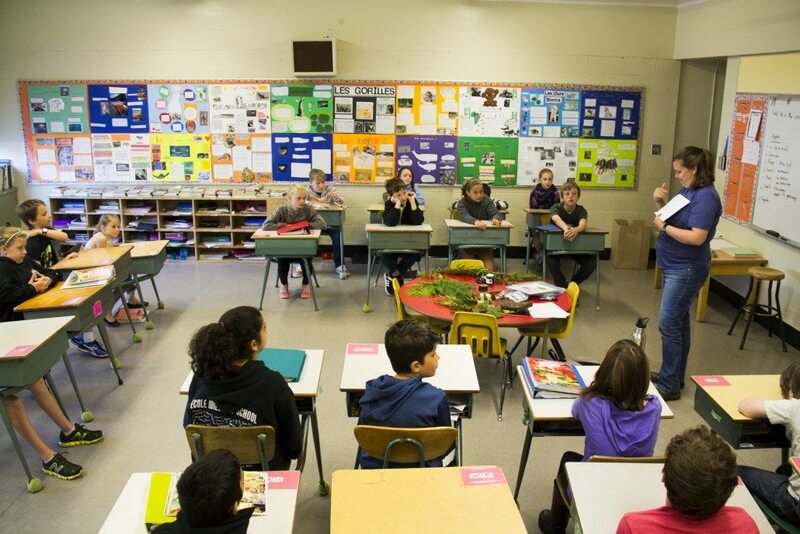 I traveled to remote First Nations’ communities delivering hands-on science programs. Over six months, I met many characters who reminded me that while there are a lot of problems out there in the world for us to face, we can face them together. When I was presented with an opportunity to teach grade one in a remote Cree community in Northern Québec, I decided I was ready to embrace this new endeavour. My students became my inspiration, though we faced many challenges together. Living in this community, I could wake up to the sunshine on a clear crisp morning (minus 40 Celsius) and set off on a snowshoe adventure across the river. I watched the northern lights dance across the sky. But the greatest highlights include teaching the kids how to make maple syrup, reading and telling stories with them, and making playdough that later ended up all over the carpet and the walls. Our class was a new experience for all of us and I rode the rollercoaster as best as I could. My proudest moment was when my students picked up bags of garbage on our school property in honour of Earth Day. It was difficult to see garbage everywhere on the ground once the snow melted, especially where the children play. Through all the triumphs and challenges, I never doubted that getting outside and connecting with nature was going to enable my students and myself to learn more about how we are a part of all living things and have a responsibility to connect with nature and protect it. When I left the community, I knew that I wanted to continue teaching with a real focus on the environment. I did not know what this would look like but I knew that in order to go about it in a deliberate way I needed to reconnect with my sense of place. So I went home to southern Ontario and spent the summer reconnecting with my favorite places, people and my dog, Lucie. Then, on a holiday to Germany, I had time to reconnect with some other great family friends who reminded me of my dream to go and live in beautiful British Columbia. When was I going to do it? I’d been talking about it forever. Towards the end of the summer, with their words in mind, I jumped at the opportunity to work for the Sierra Club BC. There is just something incredibly special about the mountains and ocean that I had always known I didn’t want to live without. So, I started a new journey, west this time. 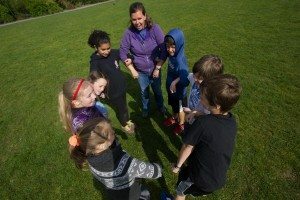 I’ve spent the past 18 months working as the Environmental Educator for Sierra Club BC, building and deepening a sense of place and connection alongside the students and teachers I meet each week. 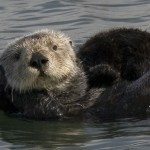 Read more about Kirsten’s experiences as an environmental educator with Sierra Club BC here and here.